Evacuable Kbr & Briquetting Pellet Dies With enriched industrial experience and knowledge, we are providing our clients with a wide assortment of Evacuable Kbr & Briquetting Pellet Dies. These dies are commonly used for producing briquettes for XRF spectroscopy. Designed with utmost precision, the offered dies are manufactured using quality-proven raw material with the assistance of pioneered technology in synchronization with set industry standards. These dies undergo various tests in order to ensure their flawless nature. 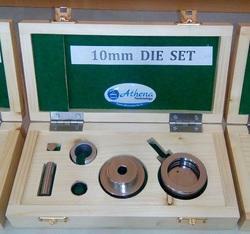 Hardened aerospace grade stainless steel is used to produce all of Athena die sets. The 3mm to 60mm dies are used primarily for KBr pellets for transmission analysis by IR spectroscopy, while the larger dies are most commonly used for producing briquettes for XRF spectroscopy. The 13mm Macro-Micro die is chosen by most spectroscopists for KBr pellets, and it is available with paper inserts with a variety of small apertures (1.5, 3, 5, & 11mm) that enable the user to make micro-pellets with a 13mm die set and also provide a useful frame for mounting and storing the pellets. All Athena dies have an upper and lower stainless steel section for ease of disassembly and they are sealed with viton seals. 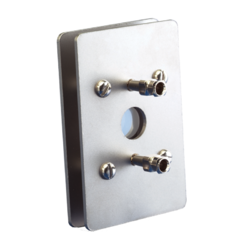 For ease of use, the weight was reduced in all die sets in the 13mm to 40mm range by adding an outer shield of aluminum. This feature makes them much easier to handle than 2 piece dies made completely from stainless steel due to their lighter weight, but without sacrificing strength or durability. The dies can be evacuated with a vacuum pump to reduce the moisture in the sample. 13mm and 20mm dies are typically used with 12 to 20 ton presses, while the larger size dies are used with 20 to 40 ton presses and are most commonly used for briquetting samples for XRF analysis. To enable preparation of the finest quality pellets and briquettes, anvils are optically polished to a mirror finish and are free from scratches or digs. All die sets in the 13mm to 40mm size range are available with optional extremely hard tungsten carbide polished anvils for use with abrasive samples. Water jacketed dies can be used for heating and cooling solid samples, and they are available in 5mm to 60mm diameter sizes. 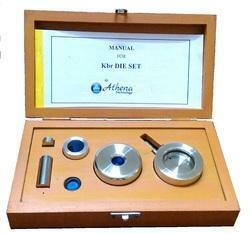 Evacuable KBr Die Set is used to form pellets/circular discs for IR-FTIR Solid Sampling /Analytical Purpose. Most commonly used die is of 13 mm dia. pellet size. 13 mm KBr Die consists of a two-piece outer die, tungsten carbide mirror finished punches (envils), pusher rod and pellet removal ring. Die is fitted with a nozzle for evacuation ( if required ). The die is manufactured from hardened stainless steel and can be easily dismantled for cleaning purposes . The entire set is enclosed in a velvetted teak-wood box , for safety and durability. The Die can be subjected to a Max. Load of 15 Tons. Tungsten Carbide is brittle in nature & is not guaranteed against breakage. Spare punches, pushers are sold in pairs only. 6 mm, 8 mm, 10 mm, 15 mm, 20 mm, 25 mm, 30 mm, 37 mm, 40 mm. Pellet Holders to suit the above sizes are manufactured by us, the standard being 13 mm Aluminium Anodized Pellet Holder. 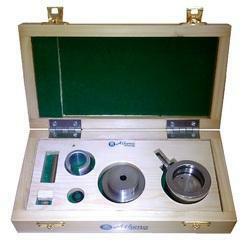 DIE Set for IR-FTIR and XRF, Evacuable KBr Die Set is used to form pellets/circular discs for IR-FTIR Solid Sampling /Analytical Purpose. Most commonly used die is of 13 mm dia. pellet size. 13 mm KBr Die consists of a two-piece outer die, tungsten carbide mirror finished punches (envils), pusher rod and pellet removal ring. Die is fitted with a nozzle for evacuation ( if required ). The die is manufactured from hardened stainless steel and can be easily dismantled for cleaning purposes . The entire set is enclosed in a velvetted teak-wood box , for safety and durability. The Die can be subjected to a Max. Load of 15 Tons. 5 mm, 8 mm, 10 mm, 15 mm, 20 mm, 25 mm, 30 mm, 37 mm, 40 mm, 60mm. Overall Dimensions 300 (L) X 270 (D) X 425 (H) mm. 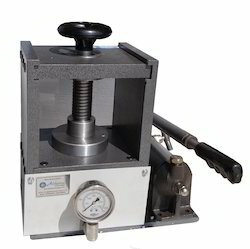 15 ton laboratory Hydraulic Pellet Press is a compact, elegant and robust machine, typically used by R & D & QC labs for various pelletising applications for IR/XRF etc. 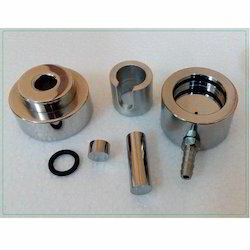 13 mm Evacuable KBr Die Set XRF Die Set FTIR Die Set, Evacuable KBr Die Set is used to form pellets/circular discs for IR-FTIR Solid Sampling /Analytical Purpose. Most comece oumonly used die is of 13 mm dia. pellet size. 13 mm KBr Die consists of a two-piter die, tungsten carbide mirror finished punches (envils), pusher rod and pellet removal ring. Die is fitted with a nozzle for evacuation ( if required ). The die is manufactured from hardened stainless steel and can be easily dismantled for cleaning purposes . The entire set is enclosed in a velvetted teak-wood box , for safety and durability. The Die can be subjected to a Max. Load of 15 Tons. 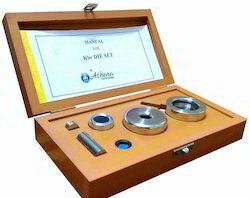 Athena manufactures a wide range of high-quality Evacuable Pellet Dies suitable compacting powdered samples into discs or briquettes. These are particularly well suited for the preparation of solid KBr pellets for FTIR molecular spectroscopic analysis and XRF pellets for X-Ray Fluorescence atomic spectroscopic analysis (as required by a number of USLP and ASTM methods), but also find use in a broad range of other applications. 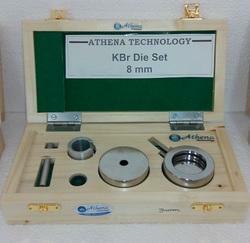 Evacuable Pellet Dies are typically used in conjunction with the Athena of Hydraulic Press Products. These Evacuable Pellet Dies produce circular pellets in sizes from 5 mm to 60 mm diameter as standard, but other shapes and sizes are available on request. These pellet dies cover a range of load capabilities. For optimum quality and durability of the pellet die, all parts are manufactured from hardened stainless steel, and surfaces that come in contact with the sample are highly polished. Each Pellet Die comprises an evacuable base, body, plunger, set of pellets, extractor ring, and O Ring Kit. Mull Cell Holder Mull Circular Windows - NaCl / KBr, To meet requirements of our clients, we are offering the best grade Demountable Mull Cell Circular Windows - NaCl / KBr / AgCl /. This product is developed from superior grade components as per the set industry standards under the direction of experts. The offered product is similar in constructions semi permanent except that the windows. As well, our valued customers can avail this product from us at reasonable rates in a given time period. Looking for Die Set ?